Senior Tiffany Holmes drives between two defender, in South Pasadena's landslide victory against the Wildcats. The 36-poin margin of victory was the team's largest in league, and will hopefully bolster the team's confidence heading into its matchup against the San Marino Titans. Girls’ basketball enjoyed yet another victory on January 26, this time on an away game against Monrovia. The massive bleachers that lined Monrovia’s side of the court were all but empty, allowing the Tiger audience to cheer on their team as if it were a home game. Almost as soon as South Pasadena gained its first possession of the ball, junior Lauren Kafkaloff scored the first point of the game on a free throw shot. 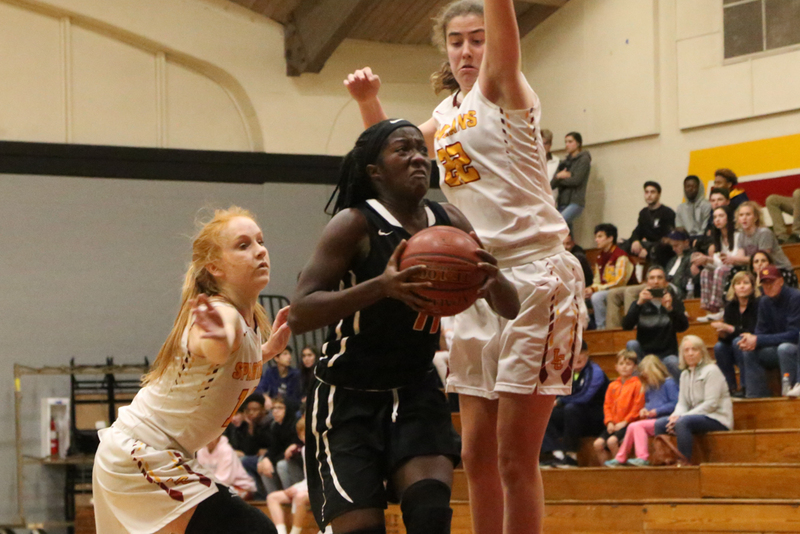 The Wildcats attempted to retaliate, but were shut down by the Tigers’ defense and a swift rebound from senior Tiffany Holmes send her opponents sprinting back to their side of the court. Time and time again, the Tigers broke through Monrovia’s defense effortlessly, and when they could not pass the Wildcats’ defenders, they proved to be completely comfortable with taking shots from distance. A series of three pointers from juniors Flannery Clark and Kayla Zhang alongside senior Naomi Kruzic (who made her first appearance since her ankle injury against Temple City) lead to the Tigers gaining a sizeable lead of 22-4 at the end of the first period. The team’s confident play-style did not falter when the game began its second quarter. The Wildcats struck first, with a two point shot, but South Pasadena easily kept them from making a comeback. The Tigers made basket after basket, some of which while pushing past aggressive Wildcat fouls and block attempts in the paint. At the half, the Tigers still lead 41-18. By the time that the second half began, it was nearly decided. Monrovia was able to put a few more shots in the basket but the Tigers continued to fire in shots one after another, racking up points as the game moved along. In the last period, a two point shot from junior Kelly Mirhan put the Tigers at a score of 70 points. As Mirhan was greeted with thunderous applause, the Wildcats sank back, defeated. There was nothing left for them to do but watch as the Tigers claimed their 77-41 victory when the final buzzer went off. The Tigers now hope to continue their recent winning streak in their next confrontation: a home game against San Marino.